across hundreds of projects, incorporating 20+ years of real world migration experience. ExperThink™ is a different type of conversion tool. Other tools provide simple substitution capabilities; e.g., replace this code with that code. This approach, however, is too limited when modernizing legacy applications. ExperThink™ analyzes the program flow -- the logical and physical flow. By keeping tabs on the program flow and tracking how data elements are used in varying processing paths, ExperThink™ learns the way the program logic interacts with the data. ExperThink™ is what enables ExperSolve to offer high quality solutions at a price that is competitive with off-shore and other low cost, labor intensive options. ExperThink™ performs the hard work of converting the source elements; the programs, screens, control language and even the data according to the conversion specification. 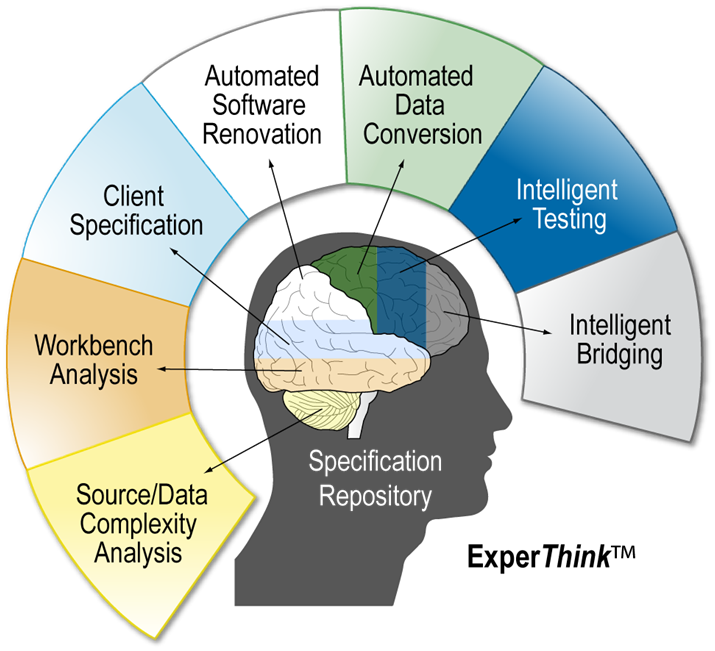 In addition, ExperThink™ provides a high degree of quality and consistency in the conversion project making the resulting code easier to maintain. At the core of ExperThink™ is the DataMap, a repository of information about the project. The DataMap contains the blueprint for the conversion, detailed facts about the source environment, the conversion rules, how the programs are to be transformed, location and format changes to individual data elements, and more -- all the information required to successfully complete your conversion / re-factoring / modernization project. By tracing the program logic and tracking the use of the data elements, ExperThink™ learns and understands which data elements are required for a particular process. This knowledge is transformed into SmartSQL™, using the power of the relational engine to access only the data required for the operation.